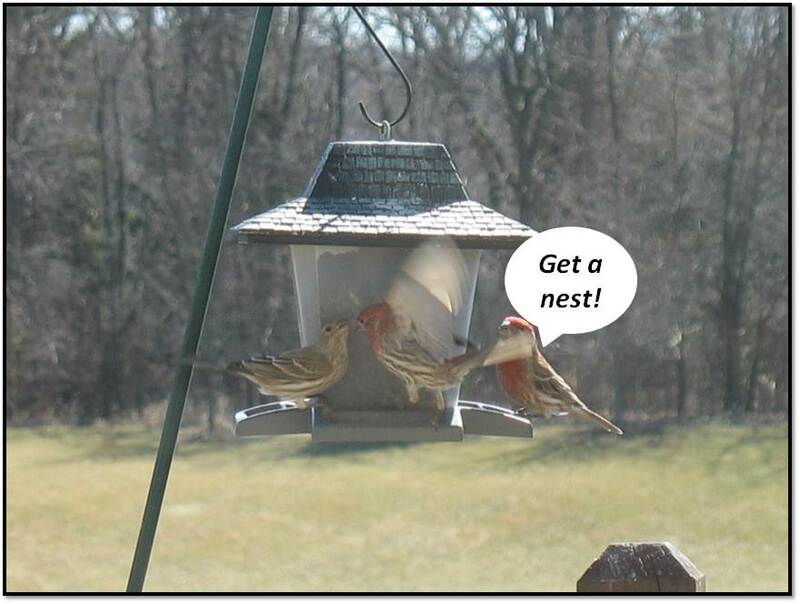 I was typing away at my computer when some unusually boisterous tweeting outside the office window grabbed my attention. 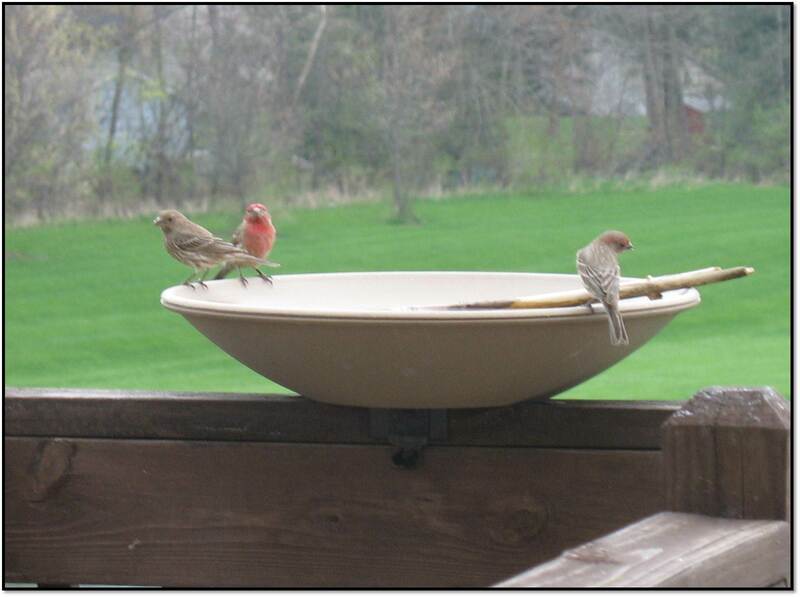 There on the deck was a male house finch energetically bowing, curtsying, flashing some tail, and singing up a storm while a lady perched opposite him looked on. Because I had a mouthful of tea, I lightly whacked Joel on the side and pointed out the window so that he’d have a look. (Gulp) “He’s courting her! That’s soooooo sweet. Look at him go! Why don’t you curtsy and sing like that when I enter a room?” I asked. My male just chuckled. Noted. Uh, I’m trying to work here pal. The passionate suitor then fluttered up in the air a few inches away from her, teasing her into a game of chase. Will You Accept this Seed? 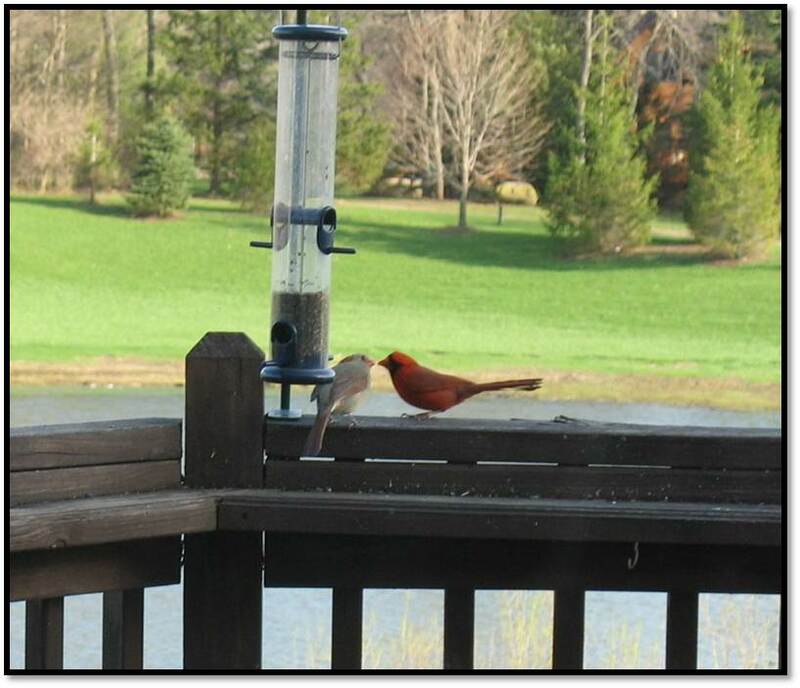 I’ve also been watching a cardinal couple for several days now. It’s touching to observe just how much this male cares for his lady. 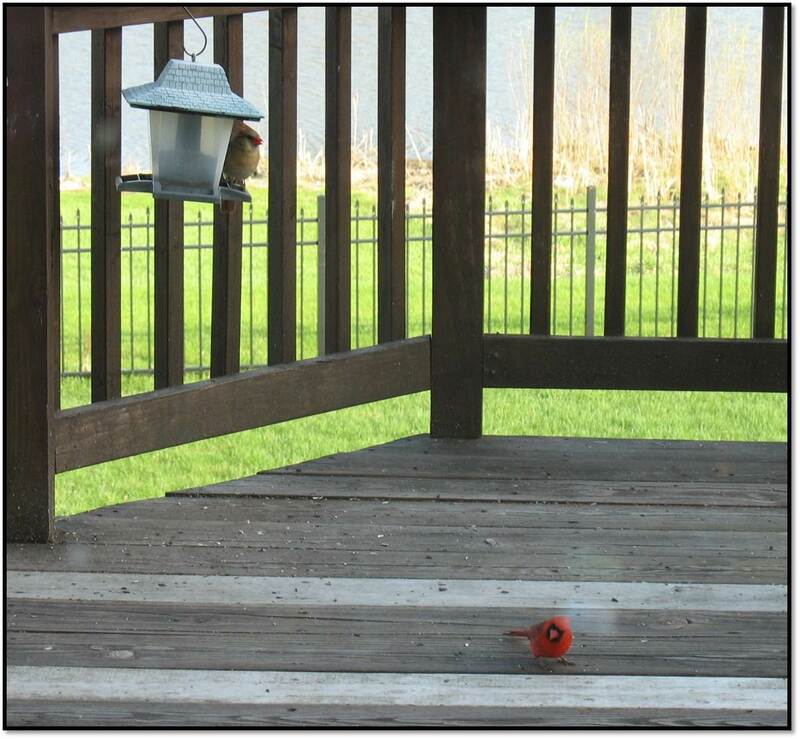 Always a gentleman and protector, he lets her have prime seating at the feeder while he hops around to nibble on what remains scattered on the floor. Even after she has eaten, he passes along a cracked sunflower seed as a gesture of sire suitability . Sure, she can crack her own shells but it’s nice to have someone else do it from time to time, no? Superb Bird-of-Paradise – I was the unimpressed recipient of a very similar dance given by a strange gent at a nightclub many moons ago. Just like the female in this video, I too fluttered away. Flamingos – They move as a group like a beautifully choreographed ballet. Or a music video from the 80’s where everyone you meet while dancing down the street jumps in to join you, somehow magically knowing all the moves. Greater Sage-Grouse – Some guys are less about the pomp and ballyhoo and more about making sure that you get a good eyeful of the size of their air sacs. Green Thorntail Hummingbird – Considering how quickly hummingbirds deplete their energy, the length of this fella’s aerial dance is impressive. I bet he’s wondering how much longer it is going to take her to make up her mind. African Weaver Bird – In my opinion, this guy wins the courting game hands down! He builds a HOUSE for his prospective lady! The other fellows can go take their flashy hips elsewhere. ← For the Love of Birds or an Excuse for a Nap?